This meeting took place on June 9-10, 2018, on the sidelines of the 18th Summit of the Shanghai Cooperation Organisation, held in Qingdao, Shandong Province, on China’s east coast. 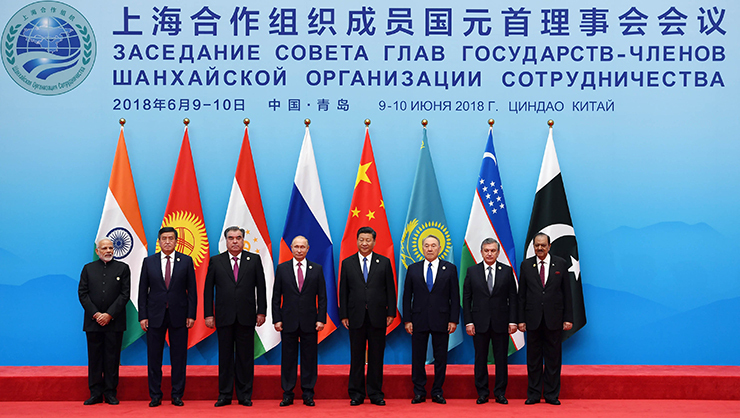 The first meeting between the presidents of the three countries took place in Dushanbe in 2014, at the initiative of the then Mongolian president, Tsakhiagiin Elbegdorj, and it was then that the SCO Summits were chosen as a venue for future meetings between the three presidents. It was decided that these meetings would be held annually. That was the start of a new stage in strategic relations between Russia, Mongolia and China: three-party cooperation. Readers will remember that the key achievement of the second meeting between the presidents, which took place in 2015, in Ufa, as part of the 15th SCO Summit, was the Road Map – the medium-term Programme for the development of three-party cooperation until 2020. The third meeting, in the 2016 Tashkent Summit, saw the approval of a general decision on the creation of an Economic corridor between Russia Mongolia and China. As part of this, 32 joint projects were planned in the areas of transport, energy, production, infrastructure, tourism and humanitarian work. The current Mongolian President, Khaltmaagiin Battulga, took part in the three-party talks for the first time in 2018, playing a very active role: he had bilateral talks with both Vladimir Putin and Xi Jinping, met the Indian President Narendra Modi and the Belarusian President Aleksandr Lukashenko, and spoke at the Plenary Session of the Council of Heads of Member States and SCO Observers, which was attended by representatives of international organisations. At the opening session of the three-party talks, the Chinese President formulated certain shared principles to be developed by the three parties, working together: strengthening of political and strategic interaction, development of mutual support, respect for each others’ core interests and consideration for each others’ unique characteristics,and strengthening of coordination and cooperation in international and regional matters. The Russian and Mongolian Presidents also spoke in favour of strengthening the cooperation between the three parties, and agreed on the importance of carrying out the Programme for the creation of an economic corridor. In general the main issue in the fourth three-party meeting was the implementation of the already-approved agreements and projects for the extension of the three-party cooperation. And in Qindao Mongolia continued in its role, clearly defined in the previous meetings, as the main driving force in the development of the three-party cooperation. It was Mongolia that initiated the Road Map, in Ufa, and the Programme for the creation of the economic corridor, in Tashkent. In the fourth meeting it was the President of Mongolia, Khaltmaagiin Battulga, who proposed moving from words to action and creating a permanent joint mechanism to carry out projects relating to the economic corridor. A Memorandum of Understanding is to be signed on this proposal in the near future. Speaking in favour of stepping up the renewal, electrification and development of the central railway corridor, i.e. Ulaanbaatar Railbus, the Mongolian President also proposed starting on the construction of a high-speed road that would link up with the Asian road network. The three states would participate in this project directly, on an equal basis, and discuss and resolve issues relating to its financing. In order to do carry out detailed research and work out the technical and economic bases for the projects involved in the Programme for the creation of an economic corridor, Khaltmaagiin Battulga proposed that a centre for investment projects be established in the near future; he also proposed mandatory meetings between representatives of Mongolia’s, Russia’s and China’s Transport and Roads Ministries in advance of each summit. The Mongolian President particularly stressed the importance of tourism in the development of cooperation between the three parties. Khaltmaagiin Battulga welcomed Russia’s initiative to set up a cross-border tourist route, the Tea Road, and raised the issue of putting Mongolia on the route of the 2019 Silk Way rally with the other two leaders. Finally, speaking in the meeting between the three leaders, he expressed a hope that the Russian and Chinese parties would look favourably on Mongolia’s proposal that the gas and oil pipeline route between Russia and China pass through Mongolia. Especially in view of the fact that this proposal had already met with a positively reception from Vladimir Putin, and that China had also confirmed that it was in favour of the proposal when Ukhnaagiin Khürelsükh, the Mongolian Prime Minister, raised the question during his visit to the country in April this year. The Russian President stressed how important it was to modernise Ulaanbaatar Railbus and develop plans for their development up to 2030, and said that 260 million dollars would be allocated for the first stage of this project, in 2018-2020. Vladimir Putin emphasised the importance of fully implementing the three-party agreement on mutual recognition of decisions by customs authorities. Talking about the role of intra-regional relations, President Putin praised the organisation of the border cooperation forums that have been held over the last 6 years, between Zabaikalsky Krai in Russia, the Inner Mongolia Autonomous Region in China and the border regions of Mongolia. Vladimir Putin declared that he attached great importance to the development of trans-border environmental programmes for the protection of unique plant and animal species, and to the development of national parks. Finally, Russia proposed that the three parties consider the possibility of starting to cooperate through public, scientific, cultural and educational organisations, and also look at the possibility of interparliamentary and inter party cooperation. On June 10 this year a bilateral meeting took place between Khaltmaagiin Battulga, the Mongolian President and Xi Jinping, the Chinese President. In the meeting, the Chinese premier proposed the following basic principles for the further development of all aspects of the relations between China and Mongolia, which would serve the core interests of the peoples of both countries: China is ready to work with Mongolia, on the basis of the principles of mutual trust, cooperation and mutual benefit, in order to develop firm contacts and cooperation in all areas, enrich the content of the bilateral comprehensive strategic partnership between China and Mongolia, and open up new areas of cooperation between the two countries. According to the Chinese premier, it is important to combine the individual strengths of each of the parties and develop cooperation on major projects, widen the links between the Chinese One Belt, One Road initiative and the Mongolian Development Road programme, and cooperate in the cashmere market. Currently Mongolia is still an observer of the SCO, and is the first nation to have this special status. That status will provide it with room to manoeuvre.